This sky map shows the location of the moon in the western pre-dawn sky just before sunrise on Sept. 11, 2014. 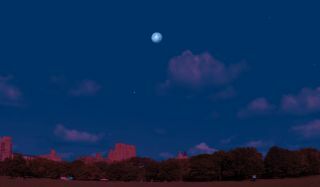 The moon will be visible in a similar location on Oct. 8, during an early-morning total lunar eclipse. The next full moon after this week's Harvest Moon will occur overnight on Oct. 7 and 8, bringing with it a lunar bonus: A total eclipse of the moon. And this week, you can practice observing the moon because it will be in the same spot in the night sky as next month's big show. One of things to consider is the moon's location in the sky during October's total lunar eclipse. For those who live along the East Coast of the U.S. and Canada this will be an important factor, since the eclipse will be getting rather low in the west-northwest sky. Will tall trees or nearby buildings block your view of the moon? Before sunrise on Thursday, the moon — 2.5 days past full — will be very near (within a few degrees) to that region of the sky where it will also be on the morning of Oct. 8 for the lunar eclipse. On the morning of Sept. 11, if you check the times given in the table accompanying this guide, the moon will appear in the sky very close to where it will be during the actual eclipse on Oct. 8. This chart lists the times of visiblity for the October 2014 total lunar eclipse on Oct. 7-8, as well as similar when to look before dawn on Sept. 11, 2014 to practice observing the moon. For eastern and central sections of North America, these times occur after sunrise in a daytime sky. Still, assuming your sky is relatively clear and free of clouds or haze, you should have no problem in sighting the 92-percent waning gibbous moon against the blue background sky. For example: On Oct. 8, for an observer in New York, the moon will begin to enter the Earth's dark umbra (the shadow) at 5:15 a.m. EDT. At that moment, the moon will stand 19 degrees above the west-southwest horizon. (Note: Your fist held outstretched at arm's length covers about 10 degrees of the night sky). Now look at the table in this guide. Notice that the corresponding time for the beginning of the eclipse is 7:37 a.m. EDT on Sept. 11. Step outside at that moment and you'll be able to get a fairly good approximation of where the moon will be for New Yorkers on Oct. 8 when the eclipse begins. This method will be especially helpful for those near and along the Atlantic coast who might want to determine where the moon will be relative to their local horizon (and local landmarks) as it sets on lunar eclipse morning as well as those in the central sections of North America who might want to gauge where the moon will be as it emerges from the Earth's shadow. This chart released by NASA eclipse expert Fred Espenak shows the visibility area and timing of the Oct. 8, 2014 total lunar eclipse. During the October total lunar eclipse, most viewers across the Americas will be able to see the event unfold in the early morning hours of Oct. 8. Along the Atlantic seaboard, the total phase of the lunar eclipse coincides with moonset, as the sun is rising in the early morning. Farther west, the moon will be emerging from the Earth’s shadow as it is setting; across the western half of North America the entire eclipse will be visible; the moon exiting the Earth's dark central shadow (the umbra) as it descends the west-northwest sky. So mark your calendars for next month's lunar eclipse! And if you do check out the moon this week, let us know how it looks. Editor's note: If you capture an amazing photo of the moon this week, or during the October total lunar eclipse, and would like to share your images with Space.com, you can send comments and images in to managing editor Tariq Malik at: spacephotos@space.com.